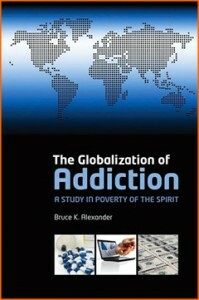 ‘Global society is drowning in addiction to drug use and a thousand other habits. This is because people around the world, rich and poor alike, are being torn from the close ties to family, culture, and traditional spirituality that constituted the normal fabric of life in pre-modern times. This kind of global society subjects people to unrelenting pressures towards individualism and competition, dislocating them from social life. I’ve taken these words from Bruce Alexander’s website and can highly recommend his book, The Globalization of Addiction, which highlights the role of disconnection or dislocation in the development of addiction. This theory makes much more sense than the classical disease model focusing on the role of brain neurotransmitters in addiction. The Film Exchange on Alcohol & Drugs website has three clips of Bruce describing the classical model of addiction and his dislocation theory which are well worth a watch.